In 1777, a parliamentary report recorded a workhouse in operation in Blackburn for up to 30 inmates. 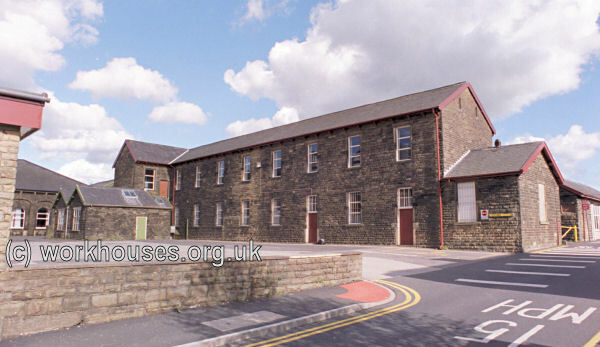 A new Blackburn workhouse was erected in 1791 on Merchant Street (later Workhouse Lane, then Hutchinson Street), Grimshaw Park — a B&Q store now covers the site. Blackburn Grimshaw Park workhouse site, 1847. The presence of a weaving shop implies that the workhouse accommodated able-bodied inmates, as well as the old and infirm. Likewise, the school indicates that children were housed at the site. 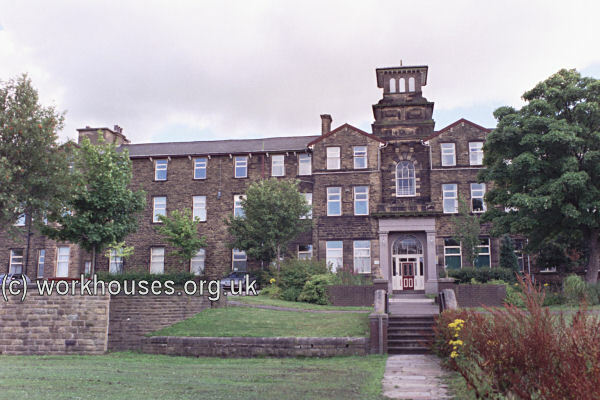 A township workhouse also operated at Over Darwen, at the western end of what is now Police Street. Other townships in the area included ones at Lower Darwen, Livesey and Mellor. County of Lancaster: Balderstone, Billington, Blackburn (5), Church, Clayton-le-Dale, Clayton-le-Moors, Lower Darwen, Over Darwen (2), Dinkley, Eccleshill, Great Harwood, Little Harwood, Livesay, Mellor, Osbaldeston, Oswaldtwistle, Pleasington, Ramsgrave, Rishton, Salisbury, Tockholes, Wilpshire, Wilton, Yate and Pickup Bank. The population falling within the Union at the 1831 census had been 60,594 with parishes and townships ranging in size from from Dinkley (population 223) to Blackburn itself (27,091). Initially, the new union decided to retain the Merchant Street and Over Darwen workhouses. In 1847, however, the Poor Law Commissioners recorded the union as operating a single workhouse — presuamably Merchant Street — with a capacity of up to 650 inmates. An 1854 directory suggests that the average number of inmates in the workhouse was around 320. 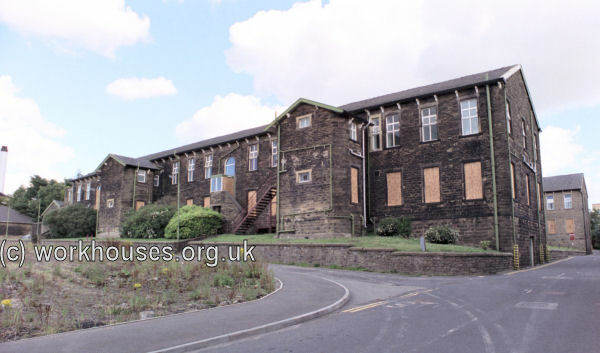 Blackburn Union eventually erected a new purpose-built workhouse on an elevated thirty-acre site on Haslingden Road to the south-east of Blackburn — its prominent location was said to have been chosen deliberately as a constant reminder of its presence to the local population. The foundation stone was laid on 20th April 1861 and it was ready for occupation on the 16th February, 1864. The buildings were designed by JE and JD Oates, cost £30,000 to build, and accommodated 1,000 inmates. The site location and layout are shown on the 1910 map below. The entrance to the workhouse itself was at the north, at the centre of two low blocks. The main building had a T-shaped layout and was three storeys in height. Male accommodation was provided at the west side and female at the east. Blackburn main block from the north-east, 2001. Blackburn main block entrance from the north, 2001. The central range at the rear of the main block contained kitchens and dining hall. A two-storey hospital block lay to the rear with sick wards at centre and lunacy wards to each side. A separate fever block stood behind. 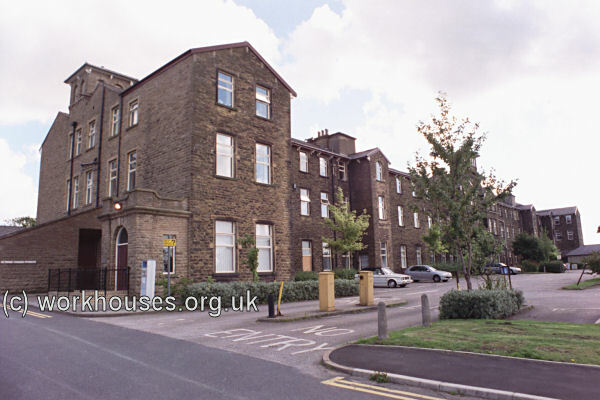 Blackburn hospital from the west, 2001. Two years after its opening, the new workhouse was visited by Poor Law Inspector, R.B. Cane, who found conditions far from perfect. A nurse, under whose sole care the inmates are placed, has lately been appointed. She is assisted by pauper inmates, who act under her direction. There are about 80 sick cases in the infirmary, a much larger number than one nurse can personally attend to; she is, therefore, obliged to trust the giving of medicines to the pauper nurses in some cases, in others she depends upon the patients helping themselves. How this can be done with accuracy and regularity I cannot understand, for the medical officer leaves only verbal directions regarding the medicines, &c., for each patient. No written labels or directions are attached to the bottles. Not a bottle or pill box (I examined them all) was marked even with the name of the person for whom it was intended. Most of the beds in these wards are too close together; some of them touch each other. There is no" night nursing" unless the nurse is called up, and no other attendance is given at night beyond such as the pauper nurses may be willing to afford. Ventilation is exceedingly imperfect throughout the whole infirmary. There is no effectual classification of cases. Cases which in themselves are highly disagreeable are not separated from others; for example, in one ward is a poor woman suffering from cancer; she is reduced to a most distressing condition. Her disorder is so offensive that I could not remain near her; yet several other patients occupy this ward with her. The discomfort they experience must be extreme. All this is permitted to continue, although there are large and excellent wards in the workhouse which are unused. There is no proper supply of water in the waterclosets, and these closets are so constructed that the foul air arising in them is drawn into the wards. There are large wards near the entrance lodge which contain cases of "venereal disease," and "bad legs." The porter and his wife are supposed to look after these cases, but they appear for the most part to be left to themselves. In the male ward were eight or ten men walking about almost naked. I was told "they were getting their dinners." The condition of the inmates of this ward was most distressing and painful to witness. The accommodation for the sick is much too limited, and the nursing quite insufficient. The sick wards are being made somewhat larger, however, than they are at present. The lunatic wards, and especially the men's day room, is too small and too confined. Better kind of beds are requisite for certain cases. In the women's lunatic ward I found one of the beds mildewed and decayed owing to neglect. Some of the able-bodied men sleep together two in each bed — a most objectionable custom. There are great dissensions amongst the officers of this workhouse, and the management is therefore lax and disorganised. Almost all the male officers have brought charges against each other, chiefly of absence from duty, and drunkenness. The master especially is charged with intoxication; an entry to that effect was made in the porter's book on the 19th instant. Although the master knew I was in the workhouse he did not appear. I sent repeatedly for him, and the reply was in each instance, that he could not be found. Under such circumstances I cannot but suspect that he was not sober enough to come before me. Of course this matter will be investigated, unless the immediate resignation of the master should render that course unnecessary as regards himself. Not surprisingly, the master was removed from his office shortly after this report was made. In 1881, large lunacy wards were erected at the east of the workhouse at a cost of £16,000. In 1888, a porter's lodge and weighbridge were built at a cost of £368, followed in 1889 by new stores costing £1,500. Later additions included a mortuary and a steam laundry. Blackburn lunacy blocks from the north-west, 2001. In 1894, the British Medical Journal set up a "commission" to investigate conditions in provincial workhouses and their infirmaries. Following a visit to Blackburn, the commission's report was highly complimentary about the workhouse's infirmary where up to 162 sick patients were being treated. They were rather less happy with the care provided within the main workhouse where beds were provided for 92 lock [venereal], itch, and infirm patients. Here, the wards were staffed by untrained attendants, with pauper help, and — as the report put it — "these poor creatures had less than a minimum of nursing." Further details are available in the full report. In 1903, a further new hospital wing was added at a cost of more than £12,000. In 1920, the innovation of a patients' cinema was installed. A wooden hospital was erected in 1925, with accommodation for 135 children and cost £2,400. The following year, a nurses' home for 80 nurses was opened costing £23,000. In 1926, a 74-bed annexe was added to the infirmary costing £11,700. In 1933, a bowling green was created for the use of patients. After 1929, the establishment came under the control of the County Borough of Blackburn and became known as the Queen's Park Institution. By then it was providing accommodation for 1,275 inmates, 100 casuals and 100 nurses. 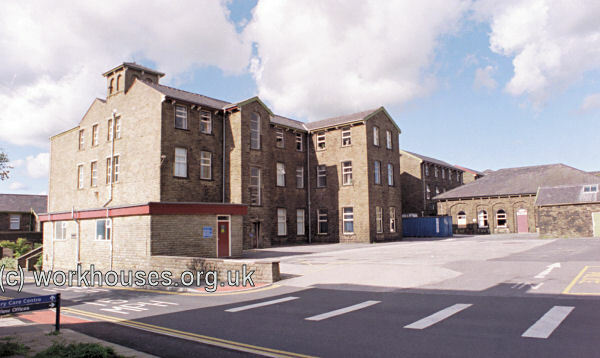 Until 2006, the former workhouse premises operated as Queen's Park Hospital but the site now forms part of the new Royal Blackburn Hospital. In around 1892, the Blackburn Union established children's cottage homes on Queen's Road to the north of the workhouse (see map above). Modern housing now occupies the site. By the early 1900s, the union was also operating homes at Cherry Street and Hickory Street, Blackburn, each housing 15 children. Matrons: Ann Sowerbutts (1870), E E Poole (1939). Lancashire Record Office, Bow Lane, Preston, Lancashire, PR1 2RE. Holdings include Guardians' minute books (1837-1930); Death register (1914-30); Children's registers (1921-43); Various registers (1885-1949); Inmates' property register (1914-43); Cottage Homes committee minutes (1900-30); etc.